1 in 5 Americans will develop a type of skin cancer during their lifetime. One person dies from melanoma almost every hour in the United States. Melanoma is the most common form of cancer for young adults age 25-29 years of age, and it is the 2nd most common cancer in ages of 15-29. There are three types of primary skin cancers – basal cell carcinoma (BCC), squamous cell carcinoma (SCC) and melanoma. 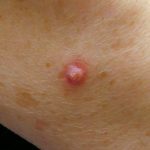 The most common form of skin cancer is BCC, which typically appears as a non-healing or pearly-appearing raised bump or papule. The lesion will often bleed and may form an ulcerated portion with q pearly border around the lesion (see photo below). The most common location for BCC is chronically sun-exposed area (e.g., face, ears, upper trunk) and it rarely metastasizes or spreads in the body. The second most common skin cancer is SCC, which typically appears as a scaly, crusted, hard bump that does not completely heal or resolve (see photo below). 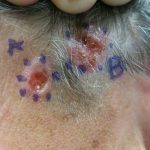 Similar to BCC, squamous cell carcinoma is usually located on sun-exposed areas like the arms, upper trunk, face and scalp. SCC may metastasize at times, but usually when located in a high-risk area of the body or is an aggressive variant. The third most common, but the most deadly skin cancer, is melanoma. Melanoma usually appears as a changing, irregular-shaped or irregular-colored mole or nevus. It is associated with sun-exposed areas and most commonly found on the back or back of the legs. However, melanoma does not need the sun to develop so you need to monitor any moles located on your skin. Melanoma has a high risk of metastasizing; especially the deeper it invades the skin. Data shows that someone dies of melanoma every hour in the US. If you have a first-degree relative (parent or sibling) then you may be at an increased risk of developing melanoma due to genetics and should have at least an annual skin exam by a provider. Skin cancer may be treated in different ways depending on the location, size, cancer variant, if a recurrent cancer, etc.). The most common treatment for skin cancer is excision with a specific margin around the lesion. The dermatologist or provider will anesthetize the area and then remove the skin cancer by cutting it out. In most skin cancer cases, excision is the only treatment needed. However, if the cancer is melanoma, you may be sent to a cancer specialist called an Oncologist to discuss other treatment therapies if the risk of spreading (metastasis) is high or suspected. If a skin cancer is located in an area needing to minimize the loss of tissue (e.g., the face), your provider may recommend you have Moh’s surgery that is performed by a specially trained dermatologist. The Moh’s surgery involves removing the cancer with very small margins, such as one millimeter, and then freezing the removed tissue while you wait in the room. The Moh’s surgeon will determine if the cancer is removed completely. If the cancer remains at a particular edge or margin, then the Moh’s surgeon will return only to the remaining cancer area and remove another small margin. This procedure is repeated until the entire skin cancer is removed. The area is then repaired and closed. Electrodessication and curettage – Destruction and removal of the cancer by electrocautery and curetting (similar to burning and scraping the area). No pathology is submitted and the wound heals on its own forming typically a round, white scar. Cryosurgery – Destruction of the skin cancer with liquid nitrogen (e.g., freezing the tissue). This option is usually limited to very superficial cancers that can be easily destroyed. Superficial Radiation – If some patients, such as those not able to undergo surgical procedures or certain elderly patients, you may be a candidate for superficial radiation therapy (SRT). This therapy involves multiple visits to the facility over a specific number of weeks to receive a painless course of radiation to the cancer. SRT is safe and localized just to the involved area of skin. The radiation is only able to penetrate slightly into the skin, which keeps the deeper tissue and the rest of your body protected from its rays. Other treatment options – Other treatment options or combination of therapies may be available or recommended due to the type of cancer, location, patient preferences, etc. Discuss other options with your provider to determine which treatment regimen is best suited for your situation. Once your skin cancer is successfully treated, you should continue to have periodic skin examinations at least every six months by a dermatologist (or provider) to ensure the cancer does not return and to monitor for new skin cancers. Additionally, you should perform monthly self-skin exams and practice good, daily sun-protection. Although you are not able to do anything about past sun exposure, you can protect your children and yourself now and in the future. Many skin care products have sunscreen added to them, including moisturizers, make-up and lip balm. This enables you to apply sun protection easily with your daily skin products. Daily use of the products will provide the most effective protection. Even if not planning to get sun, you should apply a broad-spectrum sunscreen with a Sun Protection Factor (SPF) of at least 15. If going to the beach or workings outside, then apply a broad-spectrum sunscreen with an SPF of at least 30. If participating in water activates, ensure your sunscreen is water-resistant. Remember, you should re-apply sunscreen ever two (2) hours when outdoors. Sun-protective clothing is an effective way to add additional protection to your skin. Today, there is sun-protective clothing for almost any activity outside, such as golf, swimming and running. Always do your best to avoid activities that damage your skin, such as indoor tanning beds. Tanning beds will age your skin more rapidly and increase your risk for developing a skin cancer over time. In a review of seven studies, individuals who were exposed to indoor tanning had a 75% increase in the risk of melanoma. Sunbathing outdoors causes similar damage over time, but indoor tanning beds can subject your skin to high dose of ultraviolet rays (especially ultraviolet A rays) in a short period of time. Finally, it is important to develop the habit of performing at least monthly self-skin exams to look for any concerning spots or moles. If any concerns are noted during a self-skin exam, see a doctor as soon as possible. Although skin cancer is rare in children, it does occur, so do a periodic skin exam on them also. Remember, the earlier skin cancer is diagnosed and treated, the better success and outcome in defeating it.